^ a b c d e f g h i j 渡辺晋一 2017. ^ Margarido Lda C (2014). “Oral treatments for fungal infections of the skin of the foot”. Sao Paulo Med J (2): 127. doi:10.1590/1516-3180.20141322T1. PMID 24714996. https://doi.org/10.1590/1516-3180.20141322T1. ^ Nair AB, Kim HD, Davis SP, et al. (September 2009). “An ex vivo toe model used to assess applicators for the iontophoretic ungual delivery of terbinafine”. Pharm. Res. (9): 2194–201. doi:10.1007/s11095-009-9934-y. PMID 19582550. ^ Nair AB, Kim HD, Chakraborty B, et al. (November 2009). 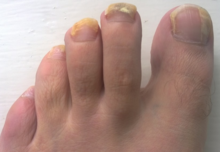 “Ungual and trans-ungual iontophoretic delivery of terbinafine for the treatment of onychomycosis”. J Pharm Sci (11): 4130–40. doi:10.1002/jps.21711. PMID 19340887.